Little did we know that the weekend of October 18th, 1997 would turn out so great. It all started with a casual telephone conversation when Tom Dobbins called Jeff Beish back in August 1997. During the conversation Jeff mentioned a need to take a vacation and to get out of town, maybe up into the mountains to see the trees begin to turn colors. Tom asked "would it be possible for you and the little wife, June, to come visit him and his wife, Karen, in the small community of Coshocton, Ohio." What started out to be a short weekend visit ended in a larger than life meeting of several well known amateur planetary astronomers. What a treat it was to see old friends again at the end of a lovely drive across some very beautiful countryside. The route would take Jeff and June through northern Virginia, the hills of Maryland, and southern Pennsylvania, into mountains of West Virginia and eastern Ohio. Coincidentally, fellow planetary astronomer from the United Kingdom, David Graham, would stay the week with Tom and would be a good time for all to meet. For several years Graham had participated in the Association of Lunar and Planetary Observers (A.L.P.O.) observing program, the International Mars Patrol (I.M.P. ), and the British Astronomical Association (B.A.A.) under the guidance of former A.L.P.O. Mars Recorders Don Parker, Jeff Beish, and the current B.A.A. President, Dr. Richard McKim. Shortly thereafter, Tom talked with Don Parker and briefly mentioned the upcoming visit by Jeff and June Beish. Don, who had planned to drive to Chicago, hinted that he and his wife, Maureen, might just drop by Tom’s place on the way back to Miami. Don was anxious to meet David Graham and since the Beish’s had moved away from South Florida in September 1996 it would be a good time to reminisce. Don had just returned from the Second Mars-Watch Workshop in Tucson, Arizona and would discuss the new projects that came up as a result of our presentations at the meeting. A week later Tom received a call from well known telescope maker and Mars observer, Tom Cave, about some details with an upcoming book they were working on. Dobbins casually mentioned the October visit and Cave immediately made plans to fly in from Long Beach, California to join the merry band of Mars observers. Cave, who had planned to attend the Second Mars-Watch Workshop, decided that getting together with old friends, and fellow Mars watchers, would be more with his liking. Dr. Charles Genovese, from Independence, Louisiana, upon hearing that Graham, Beish, Parker, and Cave would be meeting in Coshocton in October asked if it would be all right to join the meeting. Charles is a friend of Dobbins and acquaintance of Beish and Parker. 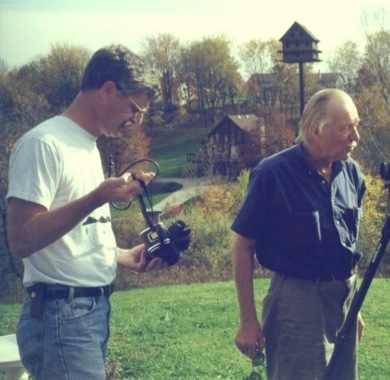 While talking with author Barry DiGregorio, concerning some publishing matters, Dobbins informed him the Dobbins Observatory would host a weekend meeting with several noted astronomers and it would be nice to have him join the group as well. Barry drove in Friday evening from Middleport, New York. 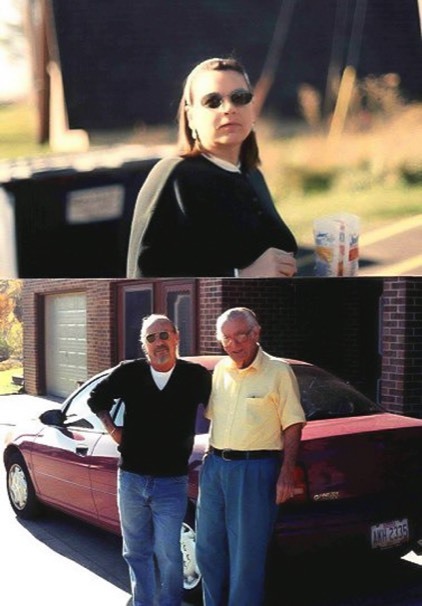 Since this small visit by Beish had turned into a larger affair, Dobbins then called old friends and long time astronomers Alex Panzer and a few other friends in Cleveland, Ohio and asked them to join the group. Al and his wife, Joyce, came with Ohio astronomers Barry Kawaguchi and Tom Rood to spend Saturday afternoon and evening with the group. Local astronomer, Drew Miller, also provided lively conversation and liquid refreshments. Driving down from Cleveland with Panzer was well known telescope designer, Diane Lucas, who is a long time friend of both Parker and Beish. So, the stage was set for what started off as a brief weekend visit had now grown into meeting of international proportions. As with every astronomical meeting side trips to local observatories and festivities are in order. Karen Dobbins planned the trips for those interested to the nearby Roscoe Village Festival and Apple Butter Stirring, and a train trip to nearby Sugar Creek, an Amish community. When asked the speed of the train, David Graham commented "let’s put it this way, the Amish horse and buggies were passing us by." For those who have ever visited that part of the country you can guess that eating would be a large part of the extracurricular activity. Tom Dobbins provided the local observatory tour with his 10-inch f/9 Newtonian and 14-inch f/14 Classical Cassegrain, housed in a very nice roll-off-roof observatory. Nightly observing sessions, planetary parties as we refer to them, were carried on during intermissions of World Series Parties and eating binges in Tom’s family room. Considering that half of us are for the Marlins and half for Cleveland, lively discussions followed! We observed Jupiter and Saturn with two superb telescopes at the Dobbins Observatory and a treat to observe with such notables as Tom Cave, who had been an amateur astronomer from 1920’s. Tom began to record and publish the subtle features of the Red Planet Mars in 1937. Saturn was of particular delight since we observed several festoons in the south equatorial belt and some dark features in the equatorial zone. David Graham was diligently at work with drawing Saturn each night, so we had to watch over his shoulder as he recorded the subtle details. He could see better than we the wisps and bands on the disc of the large gaseous planet. Saturn is not very bright and is low in contrast relative to Jupiter, so festoons and thin wisps of dark bands are difficult to see. It was good to observe again with such people. The world will probably never see the likes of Tom Cave again and to observe with him is an honor. Later on in the night, the lights were lowered and somber discussions began of the many friends we had lost throughout the past few years. As we looked around at each other this aging group of planetary observers became aware that we might be the last of the classical astronomers. In sadness we talked of our friendships with the late Chick Capen, Clyde Tombaugh, Carl Sagan, Leonard Martin, Gene Shoemaker and others who had passed away this year. We had lost a great Mars observer, Gerard de Vaucouleurs, in 1995 and several other lesser known, but close friends that same year and more the following year. Monday, those who were left broke up into two groups and took off in different directions to tour several regional attractions. The Parker and Beish families visited the Football Hall of Fame in Canton, Ohio while Graham, Cave, and Dobbins took off for the Air Force Museum in Dayton, Ohio. After a great time the two groups met at Tom’s for a last drink and conversation, then gave our good-byes as we parted company again. Early the next morning we were off to North Carolina to meet Patty and Tippy D’Auria, who were getting away for a drive thought the mountains of Tennessee and the Carolinas. Tippy was in recovery from a serious surgery and wanted to get away with his lovely wife and then to meet the Beish’s in the hills of western North Carolina. A day with the two couples of driving into the mountains was topped off by an evening meal at one of the local family style restaurants. Both were pleasantly filled with the local cuisine and returned to the motel room for a lively World Series game on TV. It was not long before everyone was slipping in and out of sleep, so we decided to end our visit and Tippy and Patty drifted off to their room. The next morning we found a local breakfast place and shortly parted company as our long time friends began their trip back to Miami, Florida. We waved and began the long drive home. Will this be the beginning of an annual affair? Maybe so! Several years ago the first "Meeting of the Mars Observers in Exile," published in Amateur Astronomy (pp. 14, No. 18, Summer 1998) took place at Tom and Karen Dobbins’ home in the small community of Coshocton, Ohio. It seems only a short time back; however, that was in October 1997. How time goes on! As the old saying goes, "time flies when you’re having fun." 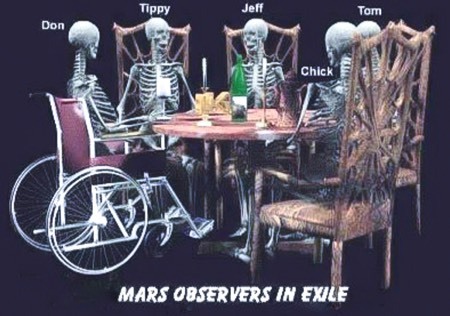 The “Meeting of the Mars Observers in Exile” again met in October 18 – 22, 2000. Yes, time does fly by. Faster, it seems, as we grow older. What a treat it was going to be to see old friends. June, and I drove in from Virginia through Maryland, Pennsylvania, into mountains of West Virginia and eastern Ohio. After a lovely drive across our beautiful countryside we arrived at the motel several miles west of the Dobbins home. After checking in to the motel, and a few moments of rest, there came a mighty knock on our door. Behold -- there stood our old friend Don Parker. Don came in by car from Chicago and was to meet his wife, Maureen, who was driving in from North Carolina. Both were visiting with kinfolk. No time to loose. We must take off to the Dobbins home to meet our very good friends Walter Haas (founder of the Association of Lunar and Planetary Observers) and well known telescope maker and Mars observer, Tom Cave. This was Walter’s first time to the meeting, and a repeat for Tom. To our pleasant surprise the gathering was in full swing. We were met by Leif Robinson and Dennis di Cicco from Sky and Telescope, and Dr. Charles Genovese, who drove up from Louisiana with a large ensemble of telescopes in his van. Maurizio Di Sciullo came in from Florida to join our merry band of exiles and added to the lively conversation of planetary astronomy. David Moore flew in from Arizona to be with this merry band of planet observers. On Thursday morning, several of us took off to tour the Air Force Museum at Wright Patterson Air Force Base in the outskirts of Dayton, Ohio. This was like old times for this author who worked at the base on and off during 1962 and 1965. After a few years away he returned in the late 1960’s to work in Air Force Research and Development programs on the old Wright Field, where the Museum is now located. Several more of the party toured the Museum on Friday while some took in the local sights in and around Coshocton. As usual, the sky cleared and we observed under clear and nearly perfect astronomical seeing that night. There were at least a dozen telescopes in use each night as we observed Saturn and Jupiter. Both rose right past sunset and all telescopes were pointed their way. Top: the lovely Patty D’Auria surrounded by trash cans and fuzzy scenery. Below: Tippy D’Auria standing to the left of Tom Cave. Friday afternoon we picked up Patty and Tippy D’Auria at the airport in Columbus and drove back to the motel. After lively greetings we all drove to the Dobbins meeting place. 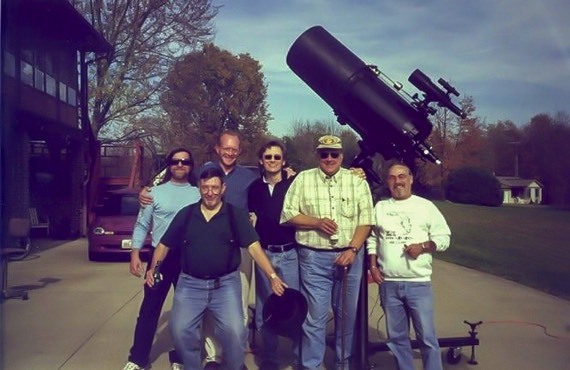 On Saturday evening friends of Tom and a local astronomer, Drew Miller, dropped by to say hello and meet the gang. Drew was at the first meeting. Also, Federal Judge Jim Graham came by for some observing and dinner. Each night Tom Dobbins provided his C-14 and several other telescopes, including a nice 6-inch f/8 that was made in Russia. Tom had moved into a new home and left his very nice roll-off-roof observatory at his former house. To our surprise, Tom sold his two very nice 14-inch Cassegrain and 10-inch Newtonian that was housed in his observatory. Charles Genovese setup his C-14, 6-inch refractor and very nice 10-inch f/6 Newtonian for our use. Our planet parties (star party for deep sky observers) began right before sunset and we would continue our nightly observing sessions through the early hours of the next morning. 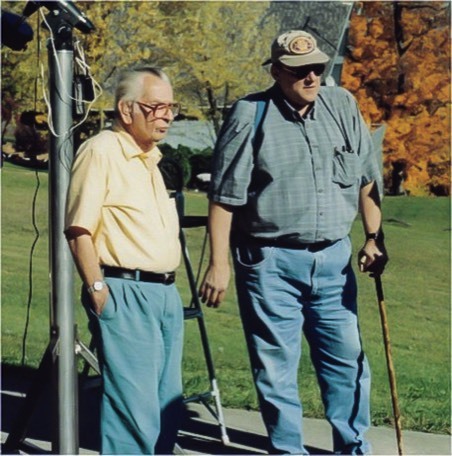 Walter Haas and Tom Cave have been amateur astronomers from the 1920’s and shared their observing experiences with the group. Of course, we briefly discussed our departed friends (i.e. Chick Capen, Clyde Tombaugh) and how much we missed them and all that has happened since their passing. Well, as always we had to end this meeting and head for home. We are looking forward to next year and maybe another meeting of the same kind. Someday we may even hold this meeting at our new home in Lake Placid, Florida. We wish to thank Jeff & June Beish along with Don Parker (and the rest of the gang) for making this article possible.